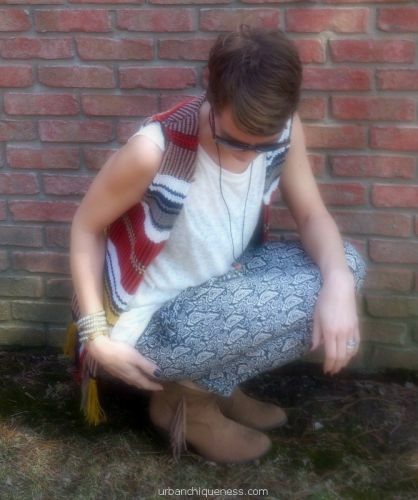 One of my favorite items for Spring is surely the printed harem pant. Since I can’t justify the Isabel Marant ones, I opted for this navy and white pair at Forever 21. I ran to the store weeks ago after I saw them on a Rachel Zoe Instagram post. Isn’t it amazing how social media works? I love that they are slouchy and soft with an elastic leg. 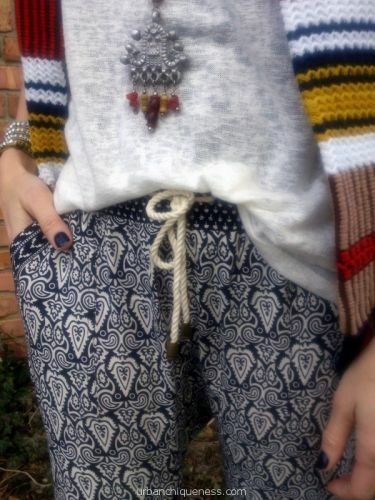 The rope drawstring also adds a little nautical touch to the tribal print, don’t you think? The perfect Spring pant. Lucky for you, they are still available on line here. As my spring fever set in, I was itching to wear them, but the weather in the Midwest has not been cooperating. Yesterday, the temps rose above 50 degrees and the sun was beaming, so I decided to bring them out of hibernation. I paired them with a sleeveless ivory sweater, my vintage knit vest and my newly thrifted silver beaded necklace along with my fringe booties. Remember, you can pair prints and stripes together as long as both items carry one of the same colors. I scored this ethnic looking necklace at the thrift store for $3, not even realizing how the silver scripture was reminiscent of the print on the pants. A happy accident that took the outfit to a whole new level! Speaking of my favorite pasttime, thrifting and trendy harem pants. I also scored the most amazing orange linen authentic Indian harem pants for $2 while scouring the Salvation Army in Michigan. You will see me wearing them layered with a bikini, a tank and flip flops in the summer. What is your favorite “Chique” trend this season? @teria…how much do they cost? Looks like Forever 21 still has the coral color for $19.80.